If you and your partner have been trying to conceive, you may have been waiting for days when you can actually take a home pregnancy test kit to see if you have successfully conceived or not. So you head to your nearest drug store, purchase a pregnancy test kit, and check the contents. For women who have never taken a home pregnancy test kit before, this can cause a lot of questions from how to use the test and how to read the results. While there are instructions included in home pregnancy test kits, it can still cause women to ask questions. How can a single strip detect pregnancy? Why are there tow lines or indicators in these tests? What do these indicators mean? What does a single line mean? What do two lines mean? If you have these questions, you should know that you are not alone since almost all women have these questions when they take their first pregnancy test. All home pregnancy test kits have the same principle of detecting the hormone human chorionic gonadotropin in a woman’s body. This type of hormone passes through the urine and vastly increases its levels during the first weeks of pregnancy. This type of hormone becomes present in a woman’s body once she gets pregnant or her egg becomes fertilized. Since the HCG levels in a woman’s body increases during the first weeks of pregnancy, home pregnancy test manufacturers advise women to take tests after they have actually missed their period. Doing this ensures that a good amount of HCG level is already present in the body, therefore, making pregnancy tests work better in detecting positive pregnancies. Home pregnancy tests often come in three forms. The cassette test, midstream test, and the dipstick test. Cassette tests will require you to take a sample of urine and place 2-3 drops of urine on the specified location. Midstream tests will require that you place an exposed area of the stick on the stream of urine for a specified amount of time. Lastly, dipstick tests are dipped in a cup of urine. All these types of pregnancy tests will require you to wait for a few seconds to a few minutes before you can read the results. Whatever the specified time indicated in the instructions are, it is important that you read the tests during this period to read the actual result. Some tests may change the result or the lines may lighten up after the specified time for reading the results. How Do You Read Pregnancy Tests? After following the instructions and placing the urine sample on your home pregnancy test kit, you should read the results during the indicated time. Most pregnancy test kits have lines that you will read to see your results. For pregnancy tests that use lines, you should know that one line is for the control test. This line will appear whether or not you are pregnant and ensure that the pregnancy test is working. The second line, or the test line, will appear when HCG is present in the urine and will indicate that you are pregnant. There are other pregnancy test kits that use the plus sign to indicate positive pregnancy instead of lines. Again, there is a control window and a test window. The control window will show a line whether you are pregnant or not and a plus sign will appear if you are pregnant. If there is no HCG detected in the urine, a negative sign will appear on the test window to indicate a negative pregnancy. You should also note the importance of the control line in pregnancy tests. If the control line does not appear when testing, then the result is invalid even if the second line appears. Having an invalid result means that you should take a second test. What if there is a Faint Second Line? There are chances that a faint second line or test line may appear when you take your home pregnancy test. This is a common query among women since a faint second line often leaves them to wonder whether they are really pregnant or not. As we have said earlier, home pregnancy tests detect the HCG levels in your urine. Now, the amount of HCG present in your body will have an effect on the lightness or darkness of the second line. Most of the time, a faint second line will appear instead of a darker line if you are testing too early and there is still a small amount of HCG present in the body. If you see the second line, no matter how light this may be, this will indicate a positive pregnancy as long as you read the results during the specified time. If you happen to see a faint red line on your pregnancy test, it is advisable that you take a second pregnancy test after a few days or so. Doing this will ensure that the HCG levels in your body have increased and can be detected better by a pregnancy test. 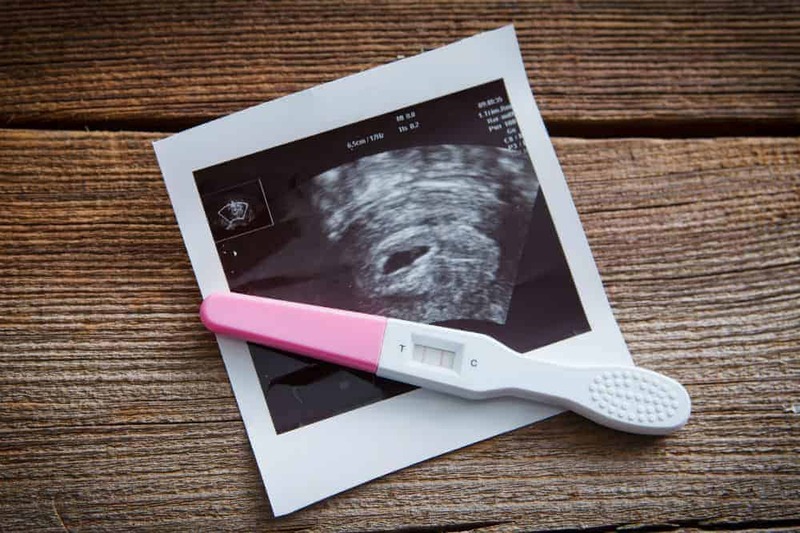 Can a Faint Test Line Mean still indicate a Negative Pregnancy? Since pregnancy tests detect the HCG levels in the urine, a faint second line will still mean a positive pregnancy. This is as long as you read the results during the specified time indicated in the home pregnancy test’s instructions. There are instances when a very faint second line may appear on the pregnancy test after the indicated time for reading the results. This is called an evaporation line. Evaporation lines appear on a pregnancy test after a long time has passed and the urine in the test begins to dry. The evaporation of the urine can create a shadow along the test line and can often be mistaken for a positive pregnancy test result. This is why it is important that you read you results only in the allotted time stated in the kit’s instructions. Reading the results beyond the allotted time can no longer be valid since evaporation lines may occur.